Japan has many kinds of traditional units. Most units are not used very often right now. But traditional goods still use the units. If you order a Kimono, the kimono shop would measure your size by "sun". Sake uses the traditional units. "Gou" or "shou" is a traditional volume unit. It is used for rice too. You know a large bottle of sake is 1 shou. We call that "1 shou bin". A large soy souce bottle is 1 shou too. I talked about masu on the sake cup ware page. A masu was used as a measuring tool. The capacity is just 6 oz. (180ml). Some Japanese use it to measure when they cook steamed rice . I have some masus in my office. 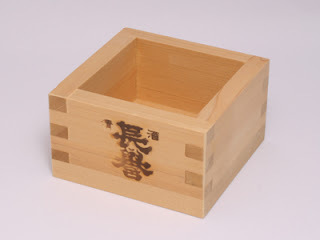 If you buy sake ware at my web shop, I will include a masu for free. Please contact me from web shop if you want it.